These photos were taken in the western part of the Fes el Bali medina, which includes the Bab Boujloud gate and extends to the Chella (Jewish quarter). Here there are some fountains beautifully decorated with Islamic patterns. The Medina of Fes has intact and well preserved city walls. 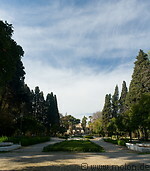 Right outside the walls lies an Islamic cemetery and the Bab Boujloud park. The royal palace is also situated in the western part of the medina.